Prominent & Leading Manufacturer from Panipat, we offer ubs-003 cushion covers. 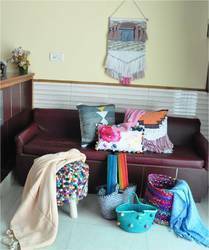 Cushion covers : 45x45 cms- $ 4.25 Handwoven cotton with lurex.Jute Basket with pom pom- $3.00 for 12x17 cms, chindi basket- $6.59 ,Jute basket with blanket stitch - $4.14. Wall hanging- pet yarn $5.50.